Cloudbank Creations - Healing the Terrorist Within! Nobody wants to be a Nobody. Everybody wants to be a Somebody. The difference between a Nobody and a real Somebody is esteem: for self and others. "Fix the blame, not the problem" is an Old World's bureaucratic response, so we have Wars on Drugs, Poverty, Terrorism, Cancer, and other dis-eases, rather than humane responses to human beings' cries for help in a left-brained, numbers-oriented, technology-driven, transnational and domestic terrorist-ridden world. Today's World of drugs, crime, violence, disrespect for self and others, revenge, greed, and conspicuous consumption are people's substitutes for basic needs: love, respect, dignity, safety, belonging, meaning, and/or a roof over their hands, food on the table, and health insurance. Could it be that there is something wrong with a society that promotes a steady diet of "more:" bad news, materialism, prescription drugs, and fast food? Should our government's Titanicism, Corporate America's "big is better," and educational systems' regimentation and teach-to-the-test be charged with contributory negligence? Shall we continue to blame the victims? 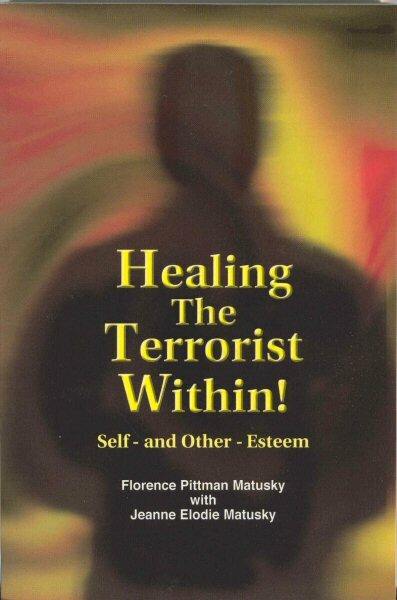 HEALING THE TERRORIST WITHIN! reminds us that words lipped but not lived reveal esteem's status, that esteem is missing when the age-old battle for human minds, bodies, emotions, and spirit perpetuates fear, dogma, a dislike of the unlike, and war, and that our society does not honor all human cultures and intelligences (including the right-brain's emotional intelligence), individuals' uniqueness, and the elderly. The human brain's plasticity means we, the people, can make a difference in our own and in others' lives when we heal the intimate and other domestic terrorists residing within and/or outside us who silence, betray, undermine, abuse, or destroy us; they are as dangerous as the transnational terrorists. We cannot heal what we do not acknowledge, understand, or work on. Without self-knowledge, we accept reactive, victim, or status quo mindsets, for we do not see people and things as they are but as we are. Only when we esteem ourselves can we truly esteem others and be esteemed by them. Healing requires mind and paradigm shifts toward wholeness and a New World, for everyone and everything on Earth are connected. Florence Pittman Matusky's early roots are in Brooklyn, NY, then in Newfoundland, Canada, and in the metropolitan NY area where she lived until six years ago. She began her professional career at age seventeeen in New York City. Florence is a graduate of Douglass College ( Rutgers University) with a B.A., Fairleigh Dickinson University (M.A. ), and Union Institute & University (Ph.D.). While an undergraduate, she worked in the insurance field--held a NYState General Insurance Broker's License--and in mortgage banking. She became a seventh-grade public school English teacher, was the Board Secretary/Business Manager of a K-6 public school's Board of Education, and, after graduate studies, was faculty for a Human Development master's program. She continues to work with master's and doctoral students. Florence's research on self-esteem began in the 1970s, and she has conducted workshops on self-esteem, thinking and learning styles, and holistic health in the US, Canada, and Russia. She lives in Scottsdale, AZ with her husband Felix and Bart, her black Labrador Retriever. Jeanne Elodie Matusky is an artist, a writer, and Florence's daughter. She graduated with a B.F.A. from The University of the Arts in Philadlephia and was a graduate student at Yale University's School of Drama, where she studied set and costume design for theatre. After 9/11/01, Jeanne spent a year teaching art in an inner city middle school. She lives in Lambertville, New Jersey.